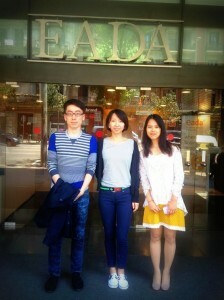 Jianxiong, Jijing and Xiaoqin are three Chinese students who went to study at Audencia in Nantes, France, and are now doing their exchange programme at EADA. They have been here since International week. Does anything else come to mind? Jianxiong: The suits! Everyone is wearing suits. It makes me feel professional. Jijing: The participation in class is challenging. In China people are not encouraged to participate but to listen… while here everything is open to debate. Jianxiong: it’s intensive, there is a lot of group work and in China we are more individualistic people. Also I’ve noticed in Europe, people keep their personal life separate from their business life, while in China you need to know people personally first. So why EADA Business School Barcelona? “Few Chinese people” they said all at once. Jijing: Out of all the exchanges we could do from Nantes, EADA had the best reputation (not that the sea, sun and culture didn’t influence me). My next step is Canada! I am grateful for my EADA experience. Jianxiong: I wanted to be able to adapt to a changing environment, to travel, to know more, be more open minded and creative. That’s what you learn when you go abroad. I quite like the European frame of mind and I hope to find a work environment that is somewhere between the two. Xiaoquin: I worked 4 years in China before EADA. But I needed international experience to be more competitive, get a better job and that’s what I am getting here. I wish I could share more of my work experience, but it is so.. Chinese! Between Audencia and EADA I’ve learned to take onmore challenges, be more aggressive, even though when I go home I will go back to the “Chinese style” of business. “We love it. Back home you are less free to go to bars and clubs. Here we live together, we have fun, we go to the beach, to bars and we travel around when we can”. To Xiaoquin, Jijing, Jianxiong: Thank you for the very good mood and the laughs, it was a pleasure meeting you!